Add a policy that affect the request and response. See the effects of the policy. An evaluation account with a proxy. If you don't have one yet, you can sign up for an account and create a proxy with the directions in Get started with Apigee Edge. curl installed on your machine to make API calls from the command line. In this tutorial, you'll add and configure the Spike Arrest policy to guard the target service against sudden traffic spikes that can be caused by an increase in usage, buggy clients, or malicious attacks. When the number of requests exceeds the rate limit, the API returns an HTTP 500 error for a request. In the editor for the new API proxy, click the Develop tab. The API Proxy Editor lets you see the structure of your API proxy and configure its flow. The editor presents a visual representation of your proxy's request and response message flow as well as an editable display of the underlying XML that defines the proxy. Click the top +Step button, corresponding to the Request PreFlow. This displays a categorized list of all the policies you can create. Leave the default names, and click Add. The new policy is attached to the PreFlow flow of a request. 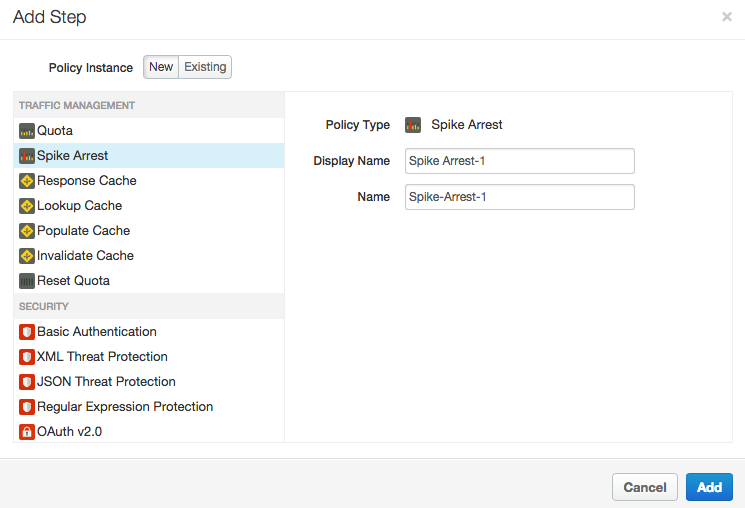 The new Spike Arrest-1 policy is added under Policies in the Navigator in the left side of the API Proxy Editor. The Spike Arrest-1 icon is added to the Designer view in the top center of the API Proxy Editor, which is a visual representation of your proxy's message flows. The XML for the policy is displayed in the Code view in the bottom center of the API Proxy Editor. The policy details are displayed in the Designer view in the top center of the API Proxy Editor. The XML element and attribute values for the policy are displayed in the Property Inspector in the right side of the API Proxy Editor. In the XML for the policy, change the value of the <Rate> element to 1pm (which translates into roughly 2 requests allowed every 60 seconds in the cloud). Note: The behavior of Spike Arrest involves a smoothing algorithm across multiple message processors, which affects the actual behavior your see. If you want more details, see the Spike Arrest policy reference topic. You can specify the rate as an integer value per minute (pm) or per second (ps). This is a very low limit and is used only for this tutorial to demonstrate the policy. Typically, you set it to a much higher limit. Notice that the Rate value in the Property Inspector also changes to 1pm. Alternatively, you can change the Rate value in the Property Inspector and it will be reflected in the XML view. Click Save to save the current revision with your changes. Use a JSON prettifier such as the json.tool Python library to make your output look better in a terminal. If you try making more calls within a minute, you should continue to get the fault message. Edit your policy to set the <Rate> limit to 15pm (which translates into roughly 2 calls allowed every 4 seconds in the cloud), and then save the API proxy. Run the curl command or refresh the browser repeatedly (cURL is faster). Notice that if you make one or two calls within 4-second intervals, your calls succeed. If you make the calls quickly, more than two in within 4 seconds, you should get the fault. But after each 4-second interval you can continue making calls, as opposed to being blocked out for an entire minute (with the 1pm setting).